These two classic Neve console EQ’s shaped generations of popular music, but what makes each one distinct? Get your gear-nerd hat on and read our contrast between the plugins, so you can effectively use the legendary “big” sound. 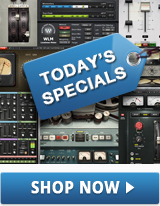 The Waves V-EQ3 and V-EQ4 are models of the 1066/1073 and 1081 Neve preamps, respectively. These are “character” EQs that emulate the sound and technology of the 70s, as opposed to today’s more surgical EQs, whose main design goal is to solve problems. There are endless debates about which product version, year of manufacture, transformer, capacitor type and so on is “best.” However, part of the charm of analog circuitry is that all units don’t sound the same. This is mainly due to component tolerances, variations in different production runs, changes in parts, suppliers and the like. Nevertheless, they do share certain characteristics; many vintage units use audio transformers at the input and/or output stage. Transformers are subtle yet complex signal processors that affect the sound in a way many people find pleasing. The electronic filter circuits have inherent non-linearities and exhibit a fundamentally different type of distortion to digital technology. What’s more, the nature of the EQ curve itself could differ (e.g. shallower or steeper slopes), and there could be phase shifts within the filter stages. These differences are some reasons why dialing in the same settings on a modern, digital EQ, doesn’t produce the same sound as vintage units. If today’s EQs had been invented first and the “vintage” ones came after, who knows which one’s people would have preferred! But as with so many aspects of audio, we’re not necessarily dealing with better or worse, but different. Understanding these differences makes it easier to apply the right EQ to obtain the sound you want. In comparison to applying the same amount of EQ at the same frequencies as modern, neutral EQs, the V-EQ3 and V-EQ4 have a slightly more forward sound in the “warm” frequencies of the low-mids and bass, and more definition in the highs. Presumably, the former comes from emulating the original unit’s transformers, while the latter comes from subtle harmonic distortion (which also widens the soundstage somewhat, as there are slight differences in the left and right channels). Both units have an analog button, which does indeed impart more of an analog sound even with the EQ zeroed out. While blind testing, I could tell when the analog function was enabled 100% of the time, and I’m not a gear snob—so yes, it makes a difference. That’s one key aspect of the sound. The other is in the choice of EQ frequencies and EQ stages, which is where the V-EQ3 and V-EQ4 differ most. The V-EQ3 is a general tone-shaping EQ with a limited set of controls; engineers tend to prefer it for more general tasks like enhancing vocals or guitar, or when mastering. Figure 1: The V-EQ3 models the EQ in the 1066/1073 Neve preamps. The V-EQ3 also models a Class A preamp topology, which provides the lowest possible distortion. The V-EQ4 is more about detail and control, and models a Class AB preamp design, which has far lower distortion than Class B designs and greater efficiency than Class A types. When modeled, this produces a slightly different sound. There are other specific differences between the two designs. High-shelf with boost/cut at two points—10 kHz and 12 kHz. Some might not feel a 2 kHz difference at that frequency matters, while others swear that the 12 kHz range is best for adding “air,” especially to vocals. The V-EQ4 has a similar design, but a different control set. Figure 2: The V-EQ4 has a more extensive control set than the V-EQ3. The V-EQ4’s low and high shelving EQs offer 5 different corner frequencies but also include a button converting them to bell responses. Both EQs have a distinctive ability to enhance the mid-range, add a bit of high-end sparkle and give “body” to a variety of signal sources. These characteristics are part of the reason why the original hardware units continue to find favor among recording professionals. 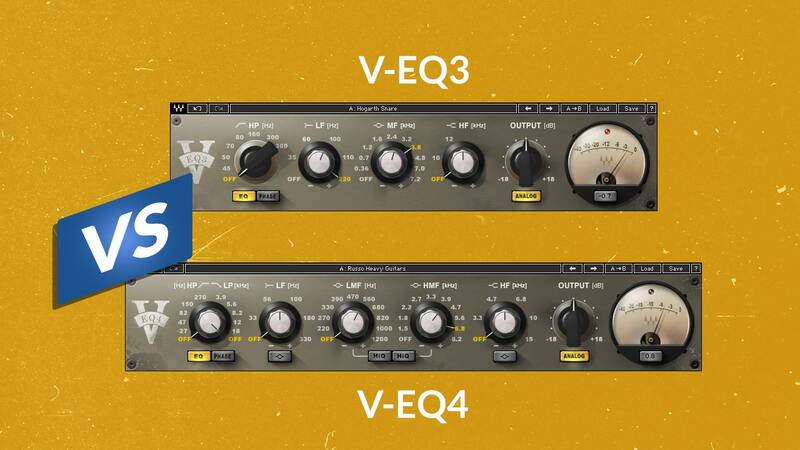 The V-EQ3, having a limited control set and fewer available frequencies allow it to be adjusted faster—it splits the difference between variability and frequencies that are almost like desirable presets. Those frequencies are often the frequencies you want, particularly for the 70s-type sound associated with this particular EQ. Also, due to the bell curve’s shape, the midrange bell tends to be more tolerant of high-gain settings than today’s EQs. The V-EQ4’s multiband design provides more precision than the V-EQ3, while still providing the vintage 1081 sound, although arguably with a slightly more even response and a touch more sparkle. There’s a greater choice of cutoff frequencies along with high-Q bell settings, which work well for tailoring the sound of individual instruments. Think of it like painting with a finer brush versus the V-EQ3’s broader brushstrokes. Having both a low and high-frequency shelving EQ, along with both high and low-pass filters leads to useful combinations—specifically, boosting highs or lows with the shelving EQ, then pulling back the extreme frequencies with the low or high-pass filters. If you don’t like to spend unnecessary time tweaking and want results fast, start with the V-EQ3 and see if the controls allow you to shape the tone as you desire it. If not, use the V-EQ4. Otherwise, if you know from the outset that a mix will benefit from the V-EQ4’s greater flexibility, you’ll still be able to get the vintage V-EQ3 sound, but with more tonal options. Thinking practically, you could try treating the V-EQ3 or V-EQ4 as “junior versions” of Waves NLS Non-Linear Summer plugins. Insert a V-EQ as the last effect in every channel strip in your virtual console, don’t apply any EQ, and enable the analog button. I tested this in Cakewalk by BandLab where you can easily “quick group” the analog buttons to turn all of them on or off for comparison. Eyes closed, I could easily tell whether analog was enabled or not; it gave a bit of sparkle that made all the instruments in the mix more distinct. This is a subtle effect, but a difference nonetheless and a desirable one to my ears. In terms of EQ moves, applying boosts can help “lift” an instrument out of a mix as well as change its tonal character. However, because of the V-EQ’s “analog” quality, it seems you don’t need quite as much EQ to add that lift as you do with conventional, surgical EQs (particularly linear-phase types). Where I find the V-EQ less useful is for instruments that are on the verge of being “screechy,” like some sampled string libraries, or any sound source with aliasing (e.g. some amp sims and virtual analog synthesizers), because the V-EQ exposes the screech more readily. Conversely, the V-EQ processors are well-suited to acoustic instruments, particularly vocals, as they provide that extra little sparkle that makes the voice stand out just a bit more than with EQ alone. The same is true of acoustic guitar, piano (when it has a prominent part in a song), percussion and the like. The overall effect can be described as adding EQ along with a touch of exciter. Try inserting it on those instruments that require EQ, but would also benefit from a more distinct sound; a subtle emphasis added with its “sparkle,” and an extra feeling of warmth in the lower mids and bass.